A tool specifically designed for pediatric occupational therapists. Organizing what you see when working with a child will make your sessions together efficient, effective and FUN! We included documents that help you educate parents about therapeutic park activities, making follow up easy. Observing a child in a natural environment can provide valuable information regarding growth and development. Conducting a therapy session at a local park with a client and his parents is an opportunity to see how the child is functioning in a typical community setting and how the parent and child engage through play. While some parents are intrinsically very playful, others might need guidance as they discover the therapeutic value of play at the park. 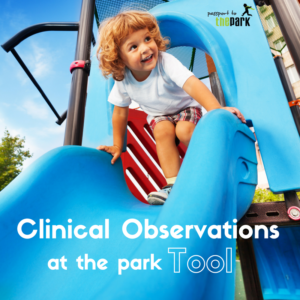 The clinical observations that we gather during our park sessions provide a snapshot of how the child is developing and navigating through his environment. With this baseline, we are able to design and tailor activities to support skill development! This information also allows us to focus on identified areas of difficulty in the clinical setting that will help the child grow and learn in their natural environments.